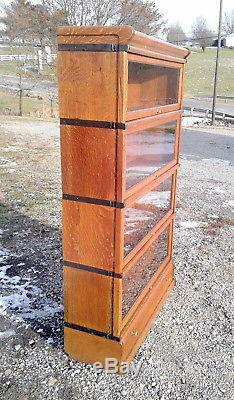 4 Stack Barrister Bookcase Globe Wernicke with Bottom Drawer Solid Tiger Oak 1915 Era. 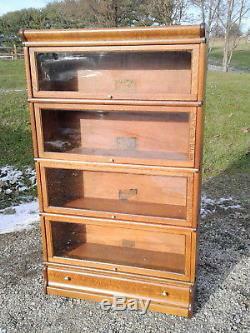 An antique Globe Wernicke four stack Barrister Bookcase with a bottom drawer dating back to the 1915 Era. Solid Tiger Oak or Quarter Sawn Oak. 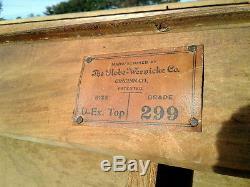 All original wooden parts and original inside paper labels. 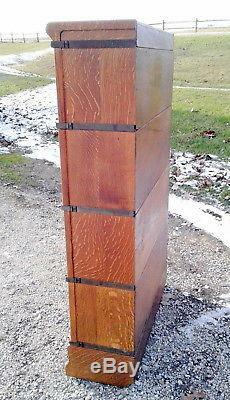 34 inches wide by 58 inches tall. 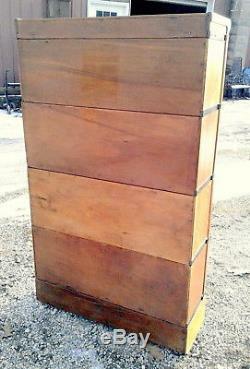 Three stacks are 32 inches wide by 10.50 inches tall by 9.50 inches deep I. 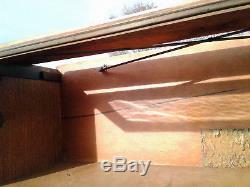 One stack is 32 inches wide by 8.50 inches tall by 9.50 inches deep I. Please note all photos for they too are a part of our descriptions. We always suggest getting several quotes because rates can vary from one shipper to another. 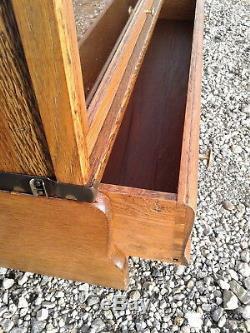 You can google antique furniture shipper and many companies are available. Thank you for shopping at Sugarcreek Antiques. We accept payments through Pay Pal. We will try accommodate your request. We are also professional packagers. We do pack with air bags, peanuts, newspapers and other types of light fillers. We promise to treat your item with care and respect when packaging for transport. 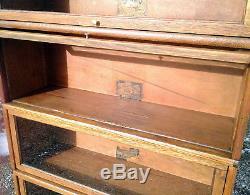 Most all of our items are from a secondary market. We make every effort to describe any flaws or damage. We never intend to misrepresent our listings. Funds need to be cleared before item(s) are picked up. All items will need to be picked up at our business site within 30 days unless other arrangements have been made. Expedite USA, Lee Sacre, Akron Ohio. Also, all our items are not guaranteed for their original purposes. They range from the early primitives, eclectic, downright weird, to today's collectibles. You probably will find almost anything you need right here in our store! We are located in the largest settlement of the Amish in the world. We reside in the beautiful Tuscarawas Valley. It is a rich rolling countryside and it is one of the larger tourist attractions. People from all over the world visit Sugarcreek and the surrounding countryside to view our Amish Swiss German ancestry. 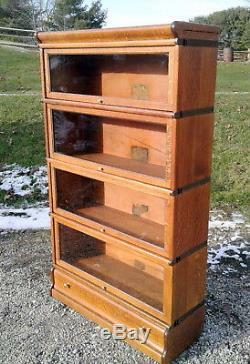 The item "4 Stack BARRISTER BOOKCASE Globe Wernicke with Drawer Solid Tiger Oak 1915 Era" is in sale since Monday, December 17, 2018. 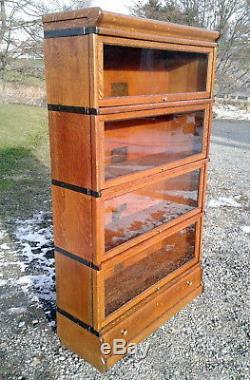 This item is in the category "Antiques\Furniture\Bookcases\1900-1950". 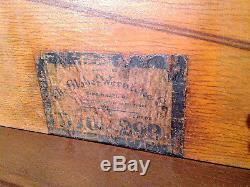 The seller is "sugarcreekantiques1" and is located in Sugarcreek, Ohio. This item can't be shipped, the buyer must pick up the item.